In April 2012, Lucy Koh, a US District Court Judge, tried to force a truce on one of the fiercest fronts of what is now commonly known as the “Smartphone Patent Wars”. She ordered Tim Cook and Choi Gee-Sung, the CEOs of Apple and Samsung, to meet and work out their bitter and prolonged patent disputes. The two firms had indeed spent long months suing and countersuing each other, all over the world, for alleged patent infringements (this infographic nicely summarizes the main episodes of this “battle”). 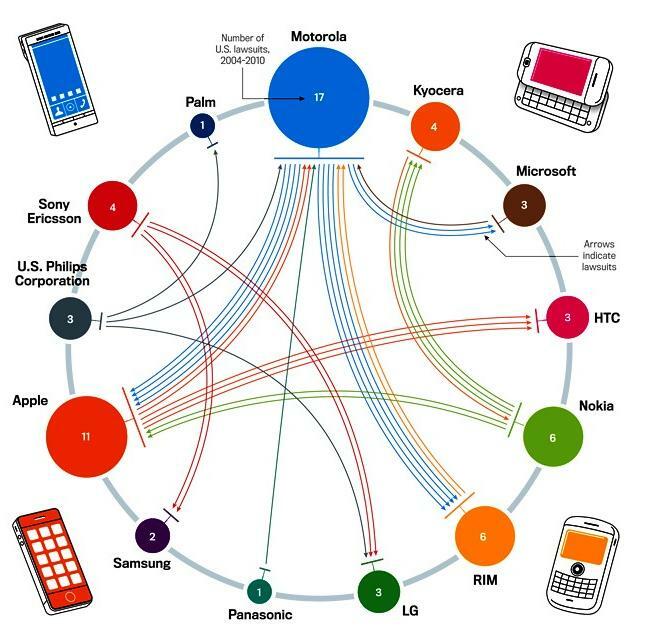 As most companies in the smartphone industry are fighting similar battles (for a very effective presentation of the existing feuds, see the animated graphic proposed by the Financial Times), the peacemaking process that Lucy Koh initiated may prove crucial for saving the industry from a potential collective suicide. The legal quagmire that currently plagues the smartphone industry results from a combination of forces that regular readers of this blog should be familiar with by now. 1. Smartphones are the archetypal example of a cumulative innovation. They exhibit indeed the two types of cumulativeness: complementarity and sequentiality. Complementarity describes the fact that a second-generation product requires the combination of a number of different first-generation innovations (‘many-to-one’). This is clearly the case for smartphones as they result from the collision between computers and mobile-phones, which are themselves already cumulative in nature. Sequentiality refers to the notion that a first-generation innovation leads to the creation of many second-generation innovations (‘one-to-many’). This is also the case for smartphones insofar as all handsets have to incorporate a number of existing standards (for, e.g., wi-fi access, email transfers or video display). 2. The previous technical features raise important-and potentially conflicting-economic issues regarding the allocation of intellectual property rights. On the one hand, complementarity raises the prospect of the ‘tragedy of the anticommons’: the allocation of strong property rights to separate right-holders results in higher prices (‘royalty-stacking’) and higher transaction costs. In this respect, some form of ‘collective’ or ‘shared’ property is more prone to favor interoperability and easy access to interfaces. Sequentiality, on the other hand, is likely to create hold-up opportunities for first-generation innovators if intellectual property rights are defined too broadly (i.e., if the first-generation innovation confers the patentee rights over subsequent innovations). For an explanation of the hold-up problem, see my post on ‘patent privateers’. 3. The importance of the previous two problems is magnified by the sheer density and size of the ‘patent thicket’ that engulfs the smartphone industry: according to estimates, a smartphone is open to a quarter of a million patent claims. If you factor in the diversity of players (as companies flock from industries as diverse as equipment manufacturing and software development), the crucial need for interoperability (just try to imagine how painful your life would be if several incompatible email services were coexisting), and the high profitability of the whole market (the global mobile phone industry reached a value of US$1.18 trillions in 2011), you easily understand why even though private solutions to the previous problems do exist (patent pools and standard-setting organizations address the tragedy of the anticommons while licensing agreements may solve the hold-up problem), these solutions are very hard to achieve in the smartphone arena. Accordingly, some players in the market have called upon the competition authorities to sort out the mess. Some observers have been rather critical of the authorities’ abilities to do so. For instance, in an article posted on this blog, Yann Ménière expresses doubts that competition authorities would be able to impose sanctions that address the fundamental problem(s). Was Lucy Koh’s move effective? 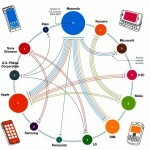 Did the ‘Smartphone Patent Wars’ calm down over the last months or did they go on with a vengeance? Could competition law play a useful role in achieving a truce in the smartphone patent war? Or are there any other solutions that could push the industry back to a path where consumers benefit more of inventions than patent litigators? Answer one or the other question in your comment.